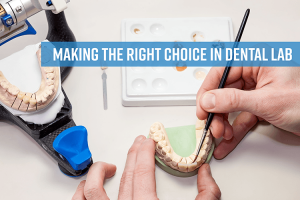 Are you having trouble choosing the best dental lab for your practice? Materials, pricing, and consistency are all important. However, your lab costs may hover around 10% in relation to your overhead, so your decision should also be focused on other factors, such as relationships and technology. and, staying in touch with issues and concerns of individuals in the group. The relationship between your practice and your dental lab should be no different. Does your lab address your concerns before, during, and after it completes your restorations? Do you trust that, no matter when you send your case, you’ll get the same high-quality results? Are you confident that, when you have a problem, representatives from your lab will be there to make it right? Your patients depend on you, so it’s vital that you can do the same with you lab. Inconsistent work, high prices, and case delays are frustrating, and they will inevitably affect your workflow. Building a strong relationship with your lab will give you confidence, which in turn will translate into amazing experiences for your patients. And that quality shouldn’t drop off over time. If you see a decline, it may be time to re-evaluate that relationship. Most every dental lab boasts about its ability to take digital scans, but how seasoned are the technicians in this new technology? According to dentaleconomics.com, approximately 66% of the dentists that changed labs in the last two years did so because of inconsistent lab quality and technical problems. Crown and bridge work typically accounts for upwards of 40% of a dentist’s workload. Simply having the ability to take digital impressions isn’t enough. Your lab should be able to help guide you through better digital impressions. By doing that, you’ll experience improved treatment outcomes, and you’ll see a significant reduction in remakes. If you don’t have an intraoral scanner, but you’re considering the investment, the right lab will be able to assist you in choosing the right type for your practice. With the growing interest in scanners by both patients and dentists alike, and the IOS industry set to hit $442.3 million by 2023, it’s likely that you’ll at least inquire about an IOS scanner in the near future. Your lab should not only want to make sure you get the best restorations, it should also keep your growth as a professional in mind. The right dental lab will have periodic CE opportunities available to you that fit your needs. Consider some topics that are important to you and your practice, and talk with your lab about CE events centered around them. Your lab should always be focused on keeping you up to date. If your relationship is strong, the technology is current, and the opportunity to grow as a professional is apparent, then picking the right dental lab will be that much easier. Once you choose, give that lab a try and make sure that it continues to support you and your goals. You, your practice, and your patients deserve the best, so there’s no need to settle for “good enough” when there is a perfect lab out there for you! At First Choice Dental Lab, we help general dentists who want a reliable, responsive dental lab by providing affordable, high-quality restorations on time, accompanied by unparalleled customer support, so that they can delight their patients, and grow their practices. It’s time to work with a lab that has your best interests in mind. *Contact us below, and get your first single-unit zirconia case for free! DENTISTS ONLY: Want Your First Single-Unit Zirconia Case for Free? Contact Us Today! *First Choice Dental Lab Only Works Directly With Dental Practices. Unfortunately, we only work directly with dentists.